LOS ANGELES • LeBron James paid the highest form of respect to long-time friend and rival Dwyane Wade after claiming he "needed" him around to "accomplish what I really wanted to accomplish in this league and that's winning at the highest level". 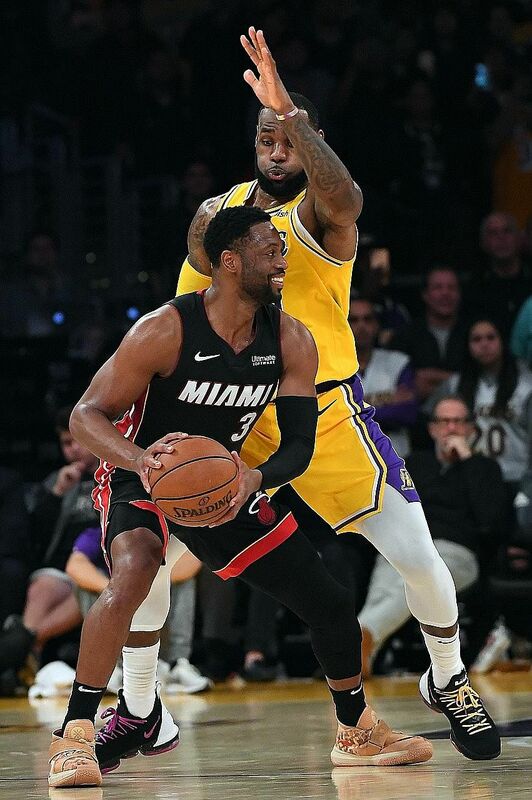 The last instalment of their intertwined careers came to an end after the pair met for the final time on a National Basketball Association court, with Los Angeles Lakers holding on for a 108-105 victory over the Miami Heat at the Staples Centre. After 16 seasons in the NBA together, Wade will retire at the end of this season, leaving James to "keep on going for the class of '03". James and Wade, who arrived in the league as part of a star-studded draft in 2003, have shared one of the sport's most storied relationships as former teammates at the Miami Heat, where they won back-to-back championships in 2012 and 2013. The 31st meeting between the two players finished with James on top after contributing 28 points for the home team, who were paced by 33 from Kyle Kuzma. Wade scored 15 points off the bench for Miami, for whom Justise Winslow top-scored with 28 points and the Lakers win meant James finished with 16 wins to 15 in their head-to-head meetings. Wade's jersey had an inscription to James that read: "Thanks for pushing me to be greater than I knew I was." The feeling was mutual for the Lakers forward, who said: "We did it our way and it was a great unbelievable ride for 16 years. I appreciate more than I can express in words what he did for me when I went down to Miami. "A lot of emotions for me right now, just knowing that I'm losing a brother in this game that I've had so many wars against, so many wars together. "There's no better way to end it than here. We're going to miss him in this league. That's for sure. One of the greatest players to ever play this game. We are going to miss Flash (Wade's nickname), man." The Heat guard also paid an emotional tribute to James, saying: "It's tough. This is what you play for, playing against one of the greatest players ever. "Whether we were teammates or opponents, we brought the best out of each other. I'm just so grateful to have been drafted at the same time as this guy. "The friendship we have is beyond basketball. But I'm going to miss this." He continued to show his love for James on his Instagram page yesterday, saying the 14-time All-Star made him a "better player, person, leader and man". While the Heat dropped to 11-15, Luke Walton's team improved to 17-10 and Wade expressed his confidence James could transform the Lakers, whose play-off drought goes back to 2013, into contenders. The 12-time All-Star added: "He can do anything he wants. He's shown that, proven that. I have no doubt this team will be in the (NBA) Finals at some point."